Hi, my name is Kayla and I am 17 years old and am brand new to collecting Baseball Cards. Last week I was at the Mall shopping for shoes and they were having a Mall Card Show. 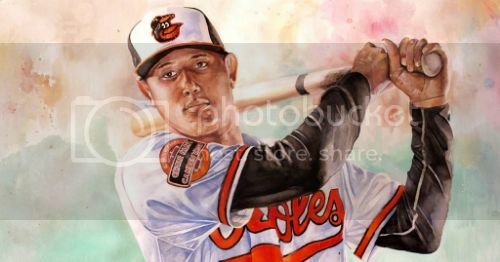 I saw a Manny Machado card that I liked and I bought it. Now I want even more Machado and Orioles cards to add to my collection. I also enjoy playing Soccer and Lacrosse. I will be graduating High School next week. Yeah!!!!! Welcome aboard and congrats on graduating! My pleasure. Seeing as you are new to the hobby I'd recommend taking it slow and spending some time seeing what is out there. Never hesitate to ask questions. Occasionally people get impatient with questions, but it's better to learn that way than to overspend or get ripped off and there are plenty of people here who are happy to help out. Cool, well I won't be buying a lot of cards because right now I don't even have a job and after graduating I am going to Ocean City to party for a week to celebrate. So cards are on the back burner right now. We have a bunch of Baltimore area members who post on here, including one who sells boxes. He also helps set up the Preakness, and posted some pics of it. Welcome aboard. I think Machado is a good one to collect. He has such a great upside and is so young he is going to be someone to collect for a long time. Welcome aboard! Great choice in Machado. He's going to have a fun career to watch. Good luck! And congrats on graduating! You're welcome! So what kind of card did you pick up? It's always exciting getting a new one. Have a great time celebrating your graduation!